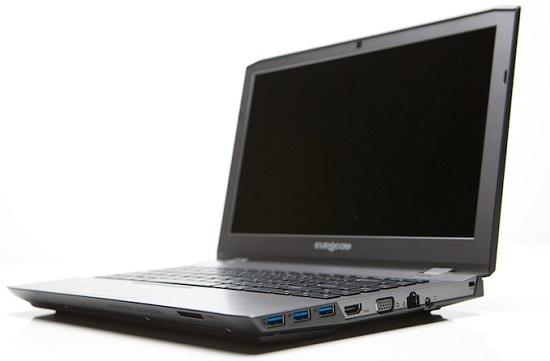 Eurocom has benchmarked the M4, the world’s most powerful 13.3” QHD+ notebook. It is equipped with a breathtaking 3200x1800 QHD+ display, an Intel Core i7 Extreme Processor and NVIDIA GeForce GTX 860M Maxwell graphics. Eurocom has benchmarked and stress tested the M4 to exemplify the performance that is squeezed into its ultra portable chassis. Gaming is all about refresh rates and great visuals, the M4 does not disappoint with a beautiful 13.3” 3200x1800 QHD+ display powered by powerful NVIDIA GeForce GTX 860M graphics. Audio is enhanced by the Sound Blaster Cinema audio platform featuring SBX Pro Studio. “Part of Eurocom’s ongoing performance verification and research and development, Eurocom engineers regularly test and benchmark different form factors with a variety of component configurations in order for customers to employ more intelligent decision making to select the perfect system for them” Mark Bialic, Eurocom President. The M4 is fully configurable and upgradable, prices start at $935 USD and can change based on the processor, memory configuration, hard drives, mSATA storage drives, operating system, wireless card configuration. With the EUROCOM M4, customers only pay for the components they need. The NVIDIA GeForce GTX 860M GPU provides a potent combination of immersive features and performance that you deserve for all your games, applications, and entertainment; while also providing intelligent power features to extend battery life.